Z and X change your hue. You are born in complete darkness. You're ... some kind of ball of energy or fluid. You can't move (in line with the theme), you can only flex your will. By flexing your will, you can wake up other balls around you and attract them to you. The first few levels are supposed to be black and white, you can attract balls to you, and consume them to increase your power and size. Then you find a coloured ball and consume it. This changes your colour. 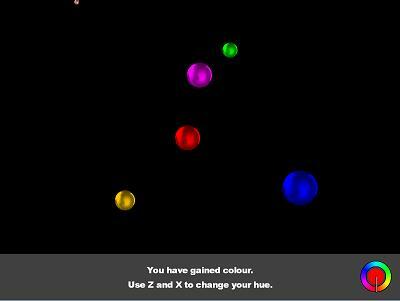 Over the course of a few more levels, you consume various other coloured balls and gain the ability to shift to their colour. By changing your own hue, you can affect which balls you attract (and possibly repel). Some balls are soft and you can consume them to increase your power/size/available colours. Others are hard and you can bounce them into you to move yourself. The mechanics of the above are in place, but there's just a single level to demonstrate it, and no real challenge or obstacles or puzzles yet. I'll probably finish it up in the next few weeks.